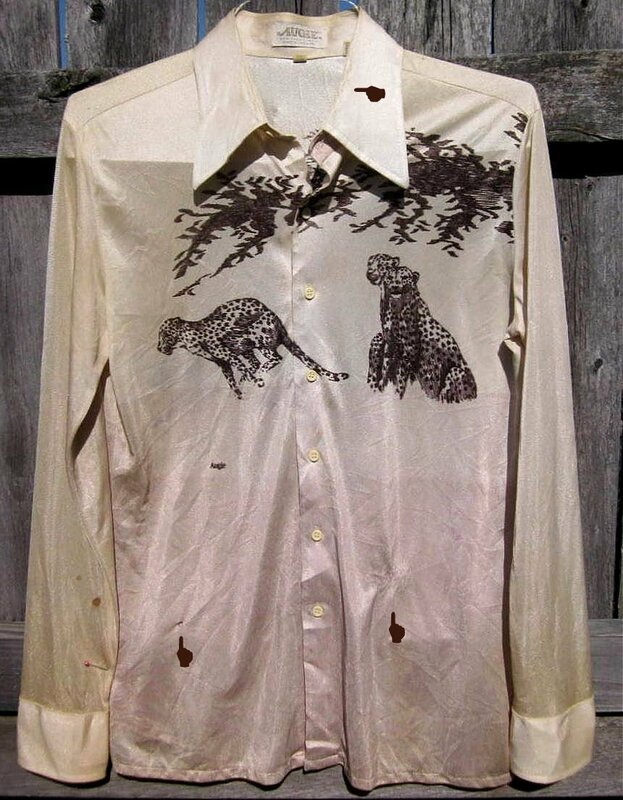 This authentic 70s shirts has some imperfections, but it is too cool to matter. The background is beige that graduates to darker shades from the chest on down. There are two more running leopards on the back with more of the foliage as well. The shirt has a lot of wear around the collar and just below the waist in an area pointed out in photo. There is also a hole the size of an small eraser below the waist as shown in photo. If tucked in, it won't show. After spot treating the shirt, there are fewer if any spots now. at armpit level for a 38 fit. The sleeve length from the neck base is 34 inches and the shirt length is 28 1/2 inches. The area between the shoulders in back is 19 inches. Again, the shirt has lots of wear, but would probably be fine for an evening party or stage wear. Running Leopards on Back Too!